We spent the third day of our spring break road trip exploring the coast on our way from Fort Bragg to Point Arena and the B Bryan Preserve. We stopped at the Mendocino Overlook for postcard-perfect views of the seaside village, walked the beach at Van Damme State Park, stopped by Greenwood State Beach in Elk, visited Moat Creek Beach and Manchester State Beach, toured the Point Arena Lighthouse, and checked out the Point Arena Pier and the tiny town. When we reached the bottom of Arena Cove and parked near the pier, we first went to the coffee shop that doubles as a bait shop so Brian could get some coffee. In the building there is also a sandwich shop and a restaurant and bar. We then walked out on the pier to check out the view from the end, and explored the rocky beaches along the base of the cliffs in the cove. The Arena Cove Historic District consists of historic structures related to activities at Arena Cove. Bounded on the north by two wooded hills, it extends west to the Pacific Ocean and includes the wharf master’s house and corrugated shed, the captain’s house and boat house, a home, and auxiliary buildings. With a rocky bottom ranging from 20-100 feet deep, Arena Cove is a destination for fishing, abalone diving, kayaking, and surfing. Offshore lies the Mendocino Trench that boasts some of the deepest waters in the world as well as the underwater Arena Canyon and Navarro Canyon that begin directly out from the Point. The 330 foot Point Arena Pier, considered to have some of the best pier fishing in California, is located in Arena Cove directly below the cliffs of the Point Arena-Stornetta Public Lands. Sitting southeast of the point, the public fishing pier includes cleaning tables, restrooms, showers, and a boat hoist for dropping boats into the water below. It is used by both sport and commercial fishermen to catch striped seaperch, kelp greenling, rock greenling, cabezon, and lingcod, as well as salmon and crab. Prior to the 1860s Point Arena utilized chutes and wire trapeze rigging to load small coastal schooners with redwood lumber and other cargo. In 1866, the first wharf was built at Point Arena in Arena Cove and by during the 1870s Point Arena was the most active port between San Francisco and Eureka. The concrete Point Arena Pier seen today was built in 1983 after a severe winter storm destroyed the wooden pier that previously stood in its place. 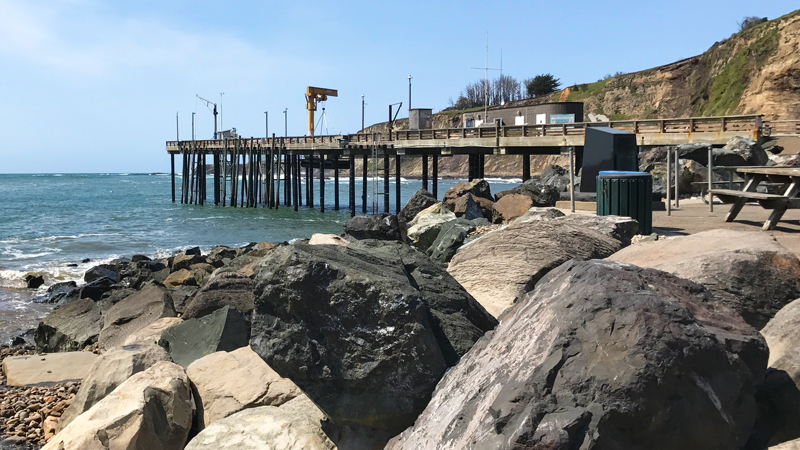 The 330 foot Point Arena Pier is said to have some of the best pier fishing in the state of California and no fishing license is required to try your hand at it. The small, rocky beach on either side of the pier is great for shell collecting and Arena Cove is very popular with surfers. Surrounded by the Point Arena-Stornetta Public Lands, a unit of the California Coastal Monument, Point Arena is one of the smallest incorporated cities in the state of California. Located on the southern coast of Mendocino County, the point is a land mass jutting out into the ocean that is the closest spot to Hawaii in the contiguous 48 states. The Main Street Historic Commercial District, 165-265 Main Street, represents the development of commercial activity in Point Arena from the late nineteenth century to the end of the Great Depression. While Main Street had been a commercial center since the 186Os, most buildings were built in 1927 and 1928 after a 1927 fire destroyed most of the town’s commercial structures. After visiting the Point Arena Pier and exploring Arena Cove, we headed into the town of Point Arena to check out Main Street and the Arena Market & Cafe, a local produce and organic market serving sandwiches, soup, salads, organic espresso, coffee, and tea. We were in the middle of our first Whole30 during our road trip and I had read about the market while researching Whole30-friendly food options. Arena Market was awesome and they had several delicious Whole30 snack options and natural foods that supplemented the food we packed for the trip. If you’re ever in Point Arena, I highly recommend you stop in! Sitting north of Bodega Bay and south of Mendocino on California’s gorgeous northern coast, Point Arena covers 864 acres and has a population of 450. Point Arena is the closest spot to Hawaii in the contiguous 48 states. The Main Street Historic Commercial District was added to the the National Register Of Historic Places in 1990. Arena Market & Cafe is located at 185 Main Street, 1st Floor, Point Arena, California 95468 in Mendocino County. It is open Monday through Saturday from 7:00 am to 7:00 pm and Sunday from 8:00 an to 6:00 pm. Arena Cove and the Point Arena Pier is located at the end of Port Road in Point Arena, California 95468, Mendocino County. Parking and visiting the pier is free. The 332 foot long pier was built in 1983 after a storm destroyed the previous pier and is considered to be one of the best pier fishing spots in California. No license is required when fishing off the pier. At low tide, Arena Cove Beach is a great spot for shell collecting, tide pooling, and treasure hunting, although there isn’t much beach as it’s super rocky. This location features some of the best waves on the north coast, which means that on a day with good surf, you’ll see surfers in the cove. Offshore lies the Mendocino Trench, with some of the deepest waters in the world. Whales often pass close by Point Arena and even come into Arena Cove occasionally. Dogs are not permitted on the pier. In the Wharf Building, you’ll find a Coffee Shop that sells bait and tackle and the the Pier Chowder House and Tap Room that’s open from 11:00 am to 8:00 pm daily. The Arena Cove Historic District was added to the National Register Of Historic Places in 1990.